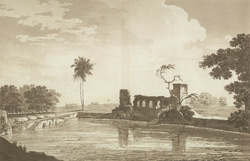 This is plate 43 from William Hodges' book 'Select Views in India'. Shikohabad was named after Dara Shikoh, the eldest son of the Mughal Emperor Shah Jahan. The ruins next to the tank (reservoir) are the remains of Dara Shikoh's hunting lodge. Shikohabad changed hands on many occasions during the 18th century and the British did absolutely secure control until 1801.